Speeding up your packaging line is crucial to efficiency. 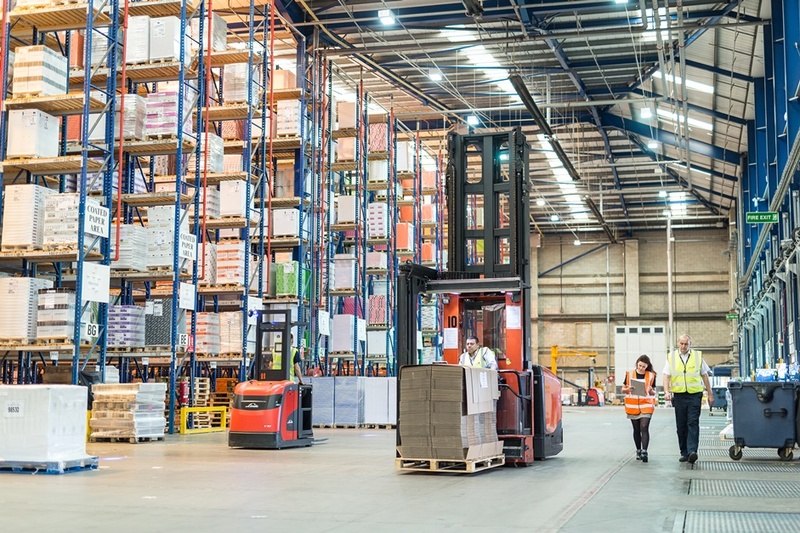 Important time might be wasted when overworked operatives are tied to completing too many tasks, and unsecured palletised loads are rejected and returned. It’s all well and good being faster, but consistency is key, after all. We’re going to show you how you can speed up your packaging line by looking at three important steps, without compromising on quality or consistency. Take a look at your carton assembly, packaging materials and dispatch process to see where your packaging line could do with a pit-stop. First off, we all know that carton assembling can be a really fiddly, time-consuming task. But when using certain alternative materials or automation, it becomes possible to cut half the time it takes to assemble your packages. This not only helps to speed up your entire process by being an easier and faster solution, but it should also leave your operatives more time to concentrate on other important tasks. Self-erecting crash-lock boxes are a great way to package products much faster, as they cut down the time it takes for operatives to assemble. In fact, they’re three-times quicker than regular boxes, making them ideal for increasing volumes at times of high demand. User-friendly automated tape application machines automatically seal the top and bottom of your boxes. Being easy to adjust for different case sizes and mobile enough to use flexibly, they speed up sealing on different packing stations, on demand. This frees up packing operatives, and not only makes the assembly faster, but also much safer. Another way your packing might be slowing you down is the need to carefully pack fragile items with void-fill. Polystyrene chips and bubble wrap are a great way to protect items, but they do come with their downsides. They’re big, so they’re hard to handle, and they take up a lot of warehouse space. With the right materials, however, you can speed up the time it takes to pack your items without any fuss. Packaging operatives usually end up slowing down when carefully packing fragile or delicate items, but introducing specialist packaging materials such as suspension packaging and retention inserts might help to speed up output. By getting rid of the need for void-fill, solutions such as these can speed up the time taken by your packaging operatives to securely pack items. These systems can create cushioning and void fill product on-demand where and when needed. They‘re quick and easy alternatives which provide excellent product protection, while getting rid of the need for manually-handling bulkier products such as polystyrene chips or conventional bubble wrap. So, you’ve got the right materials, you’ve packaged up all of your items, and now it’s time to dispatch. But sometimes this is the part that can let you down at the very last minute. Not only is hand packaging a lengthy process, but if the items aren’t secured properly, it might lead to items coming back to the warehouse for exchange. But with some carefully selected automation, you can speed up the way you secure your packages for delivery, and make sure they’re not going to be returned. It’s possible to increase the speed with which packages and boxes can be secured for shipping, and because they’re mobile, they can be easily moved to packing stations experiencing high throughput. This not only speeds up the load strapping, but also improves the consistency of your packages. 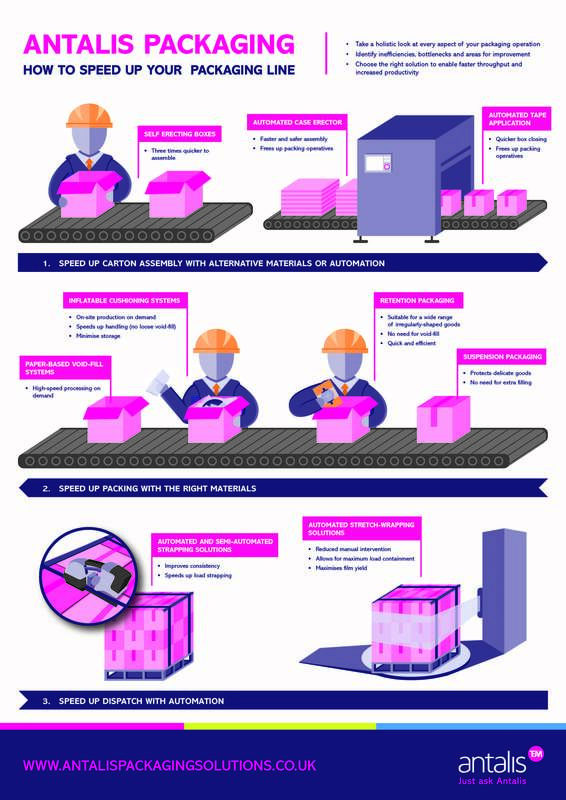 Increase the speed palletised loads can be tightly secured, while also reducing the need for manual intervention and maximising the yield from each roll of film. Plus, removing the need for hand-wrapping could eliminate some health and safety concerns, especially relating to repetitive strain injuries. Taking a detailed look into your whole packaging and distribution process can give you the ability to see where you can make items run more smoothly, from the point at which they arrive, right through to when they’re dispatched. These 3 crucial steps could help you eliminate unnecessary work, streamline processes, and make sure every bit of material and technology used is the perfect fit for purpose. Have a look at the infographic above to see what we mean.